Astronomy Science ~ Asteroid 4 Vesta is one of the largest asteroid that discovered in 1807. In fact, this asteroid has the second largest mass after mass of the dwarf planet Ceres in the asteroid belt. 4 Vesta has a diameter of about 326 miles (525 km) and now has its own geological maps released, based on the data created by the Dawn spacecraft as it passed near Vesta in July 2011. 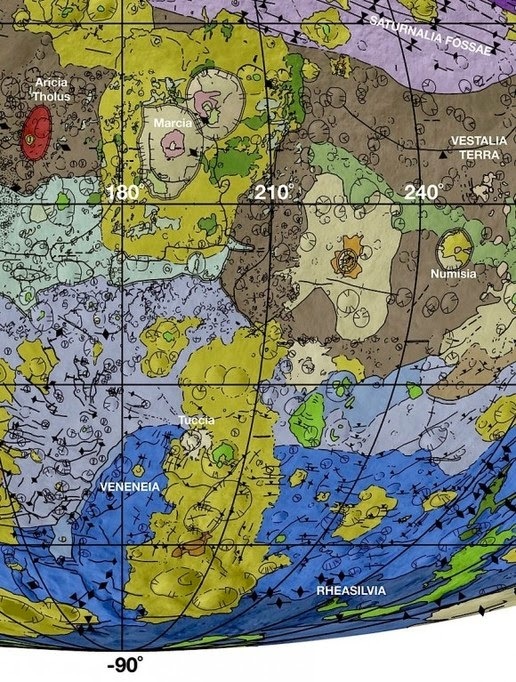 The new map Vesta is supplied with a set of 11 other scientific papers published this week in a special Journal of the Icarus journal. A team of 14 scientists to map the surface of Vesta uses data of Dawn spacecraft. Scientists use geological mapping as a way to study the geologic history of planetary object. David A. Williams of Arizona State University, Tempe is one of the team leaders this mapping effort. Dawn studying Vesta from July 2011 until September 2012. A towering mountain at the south pole of Vesta - it more than twice the height of Mount Everest - look at the bottom of the image. A series of three craters, known as the "snowman" can be seen at the top left. 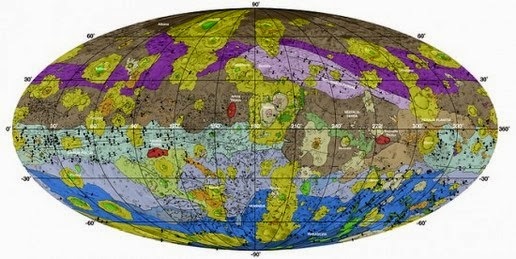 "The campaign of geological mapping in Vesta takes about two and a half years to complete and produced a map that allows us to recognize Vesta's geologic time scale in comparison to other planets," said David A. Williams. Vesta geological time scale is determined by the sequence of events a huge impact on the asteroid's surface, mainly through three objects that hit him, which resulted in crater at Vesta which is now called the crater Veneneia, Rheasilvia and Marcia. 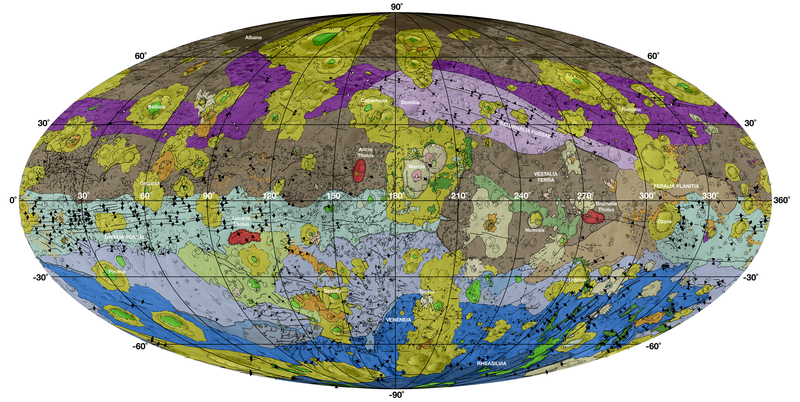 The new geological map of the asteroid Vesta seen in detail. The brown color is a region of the oldest, most heavily cratered surface. Purple and blue colors representing each field created by the impact Veneneia and Rheasilvia. Bright purple and dark blue at the bottom of the equator part in Rheasilvia basin and Veneneia. Green and yellow represent relatively young landslides or ground material coming out of the crater created during the impact. Tectonic features shown by the black line. Veneneia is the oldest of the three craters of this crater. Veneneia has a width of 250 miles (400 km). While the crater is a crater Rheasilvia younger, can be seen because it is located on top Veneneia. Rheasilvia is almost as wide as Vesta itself, has a width of 310 miles (500 km). The crater is centered near the south pole of Vesta. Lastly, there is Marcia, the crater created by the impact of the most recent by smaller objects, a series of three craters are known as "Vesta's snowman." Meanwhile, the skin layer of the oldest in Vesta is prior to the impact Veneneia. 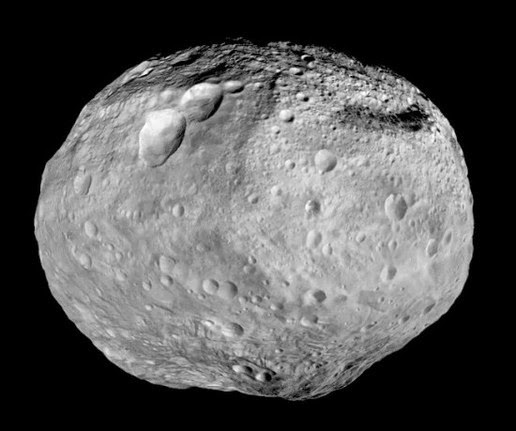 "Asteroid Vesta as the remnants of the formation of the solar system, could give scientists a view into the past of the solar system. 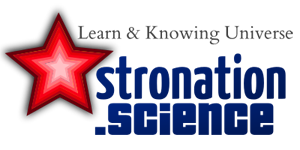 Asteroids also harbored molecules that are the building blocks of life and reveal clues about the origin of life on Earth," NASA said in a press release. Dawn orbiting Vesta between July 2011 and September 2012. Then Dawn to leave Vesta orbit toward the other objects in the asteroid belt, the dwarf planet Ceres.